It seemed that summer might never come that year but after weeks of rain the skies cleared one night and sunrise, silent as snowfall, brought sleepy gasps of surprise. Beyond the mouse grey farm cottages, acres of farm land and poppy fields rolled down to the river and, in the distance, a pale mist hung over the Ridge. Today the whole world shone, vibrated with colour. John Deaville saw none of this. For him it was an unbearably quiet morning; today even the tractors and farm dogs were still. Watching from an upstairs window he sipped his coffee slowly. Before him he saw a great complex of cattle sheds and warehouses overlaying the little farms, and fields of high yield crops. A vision spoiled only, he thought sourly, by the wretched tenants. What a backward lot they were with their drab little cottages and namby-pamby herb gardens, their noisy brats running wild in the fields. He scowled at the mouse grey buildings with their broken fences and ramshackle sheds, swiftly demolishing them all in his mind. He put down his coffee cup and drew the heavy drapes carelessly across the window, knocking over a red lacquer vase of dead tulips as he did so. The last of the petals wavered on their stalks and scattered their pollen. He mopped up the watery dust with his sleeve and sank down onto the bed and yawned. On the floor – and at odds with the orderly opulence of the room – were boxes filled with books and next to them an open suitcase still unpacked after weeks. Shirts, poorly folded, lay alongside jackets in need of a hanger and crumpled tee-shirts, already worn. He wriggled out of his damp, stained shirt and threw it on the floor. He had found the tulips on the steps of The Hall, still in bud then and stuffed into an old watering can. His first night here – how many weeks ago, was that? Six maybe: no more. There had been a little box of provisions too; a loaf of bread (still warm), and six eggs, each carefully wrapped in tissue. With equal care someone had inscribed a message on the side of the box: Welcome Home. His hand strayed to the empty side of the bed where a notebook lay. There was a letter too, crumpled as though having been squashed into a tight ball and tossed into a bin, then later retrieved, smoothed out as an afterthought. He held it against his chest. How could this ever be home without Jenny? He turned over and his heart turned over too. Tempted by sleep he closed his eyes. Even in his dreams there was a distance between them. He saw her, pushing an empty pram down the lane at dusk. Evening after evening she’d made the same solitary journey, walked for hours, glad to be unobserved as night fell. Neighbours had looked away, stayed away, unsure of words that might fit. He remembered the cards, lined up on the mantelpiece, gathering dust, and the day he’d taken the call: We did all we could but he just came too early. One evening, seeing her leave he could bear it no more. ‘Tim!’ He lunged at the cards, swept them to the floor, stamping and cursing. That night they clung together, stirred by the passion of strangers or lovers, never to meet again: illicit, irresistible. Never again, were their thoughts. This is the last. In losing their son they had lost each other. Later, much later, there were girls, five, six, he had lost count – but each time he told himself: This is the last. In losing his son he had lost himself. Moving here to The Hall had been his attempt to make things right, start again but in the end Jenny had refused to come. He picked up the crumpled note and read it again, eager to find the hope that had so far eluded him. ‘I can’t leave here, John,’ she had written. ‘This is Timmy’s home.’ The words had a dreadful permanence about them, as though etched in stone. Soon his thoughts were interrupted; from above came the now familiar sound of footsteps, the to-ing and fro-ing of someone busily occupied. They had become company almost; a reminder that he wasn’t alone, even though with Mrs. Bloom the housekeeper gone, the house was empty. One evening he took a torch to search the attic but found there nothing but a number of broken picture frames and a grimy old notebook. He fingered the little notebook now, its cover inscribed with a pair of interlocking initials, EC, and the date 1897. Jenny would love this, he mused, recalling her fondness for old things. Resigned, he wrapped his thumb around the finger where his wedding ring had once been (there was still a little groove left there – how soon might that fade, along with everything else? He wondered). His thoughts turned back to his land. Over the weeks to come he set to work on his land development plan. The days would be taken up with calls to fertiliser companies and meetings with lawyers whose job it was to find loop holes to eject the tenants. At night he would dine alone, a place set for him by Mrs. Bloom. Sometimes, bored, he took a tray to his room and turned his attention once more to the little notebook. One day he examined the deeds of The Hall and found that it had once been the home of a 19th century artist called Edgar Childes. Childes, he discovered, was best known for his paintings of country life, in particular the hunt. Wealthy and ambitious with a reputation for extravagant living, Childes was a keen huntsman himself. His work had been much sought after by the new middle classes, landowners, and industrialists, although at the height of his popularity failing eyesight brought his career to an abrupt end. He died, a recluse, in 1897. Commission for H.A.B. almost done. A skilful work but lifeless, I cannot say why. Vision much weakened. There followed a series of sketches, clumsy and childlike, mostly struck through or scribbled over. The last few pages of the little book were the most difficult to read since by now Childes’ sight had almost gone. Purposeless. Can no longer see to write, let alone to paint. those with more wealth than discernment. John Deaville moved to the window and looked out on the quiet fields. He was not often given to self-enquiry but now uneasily he began to consider his own life. Below him in the courtyard a tenant farmer was tinkering with a broken down van. In his mind, though, John was touring The Hall. As if in a dream, he passed through doors rarely opened and explored rooms that were never used. He wandered like a ghost, a visitor in his own home, but aimlessly and without the curiosity a stranger might have. ‘Do I need all this?’ he murmured at last. At this point a shabbily dressed woman had joined the farmer with a flask of tea. The two were soon chatting and laughing together, their faces bright. Children darted between them, clutching at the adults’ sleeves, hiding, playing noisily. After a while they trailed off together, arms around shoulders, into one of the little cottages. Envious suddenly and unbearably sad, he returned to the little notebook. me. Guided by the Presence I reached for my brushes. The next morning Mrs. Bloom arrived early. She placed porridge and toast before him and then brought in a bowl of freshly picked strawberries. ‘A little gift for you from the tenants, Mr. Deaville,’ she announced cheerfully and drew back the heavy drapes. Dust motes danced around her on ribbons of light. ‘What a grand morning for the market.’ Then seeing the White Hart with the human eyes she nodded, as though unsurprised and opened the windows wide. A little crowd had suddenly gathered in the courtyard below. ‘Have you seen, Sir?’ She beckoned him to the window. The broken-down van had now been mended. Its engine was ticking over noisily while a group of farmers loaded great crates of vegetables and fruit on board. They were the finest crops he had ever seen. Whole cheeses, boxes of eggs and pots of preserves came out of the little cottages, followed by trays of bread, pies and fruit cake. For the farmers’ market, Mrs. Bloom explained. Visitors from the city paid good money for organic food. But Mrs. Bloom didn’t really need to answer for somehow he already knew. They did it together. What little they had, they shared. 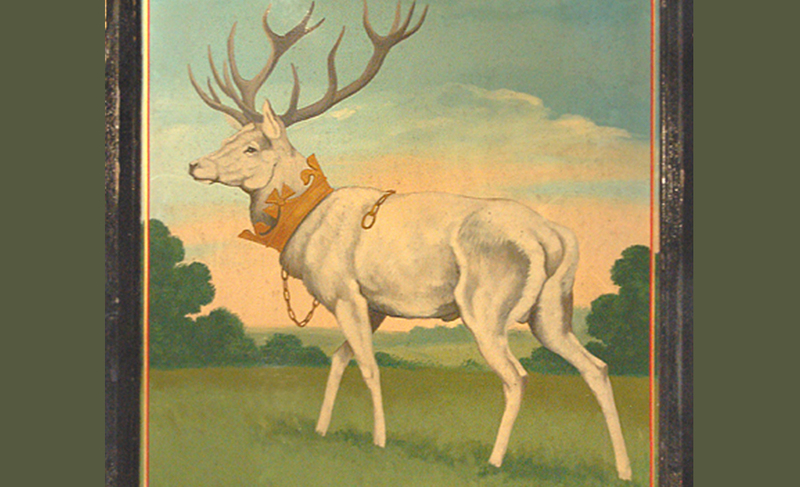 The White Hart with the human eyes stared out from its frame and caught his eye. This land belongs not to you but to all who live here, it seemed to say. And looking into the Hart’s eyes he realised exactly what he now had to do. ‘What a wonderful idea, Mrs. Bloom,’ he said excitedly. Suddenly light-hearted he climbed the stairs, three at a time, to his room. There he opened the heavy drapes and diamond clear in the morning light he saw the land as it could be. The fields were now home to woodlarks and butterflies; there were hedges of cherry and alder fruit, orchards and allotments. And even the tenants’ mouse grey cottages were freshly painted now, their fences mended. And like Edgar Childes he found his own vision was growing too. He imagined the rear of the Hall where a sign announced Deaville’s Cottage Cooperative and out buildings that now housed an organic shop. For all to share! He smiled and thought of Jenny and how proud she would be. ‘Come home to me, Jenny,’ he whispered and already the distance between them seem to have disappeared. Impulsively he reached for his mobile phone and imagined the empty rooms now filled with friends and family – and maybe more children of their own. Come home, Jenny! He wrote. This could be your finest work, a voice in his heart said. Then he began to unpack at last, first the books then his clothes, still folded in the suitcase. It was nightfall before he had finished and by now the tenant farmers had returned. Together they lit a bonfire and began to prepare a shared supper. He listened again for the footsteps but tonight, for the first time, there was no sound, just the laughter and singing from the gardens. Why not join them, John? The voice in his heart prompted. After all, what have you to lose? Only my loneliness, he replied and, as he hung up the last of his shirts in the wardrobe, he felt almost happy. He glanced around the room for anything he might have missed, smoothed the bedcover and rearranged cushions. He unravelled a bunch of sweet peas and placed the lacquer vase back on the table. Just then his mobile phone began to beep. I miss you too, the message read. He smiled. I have, he decided, finally come home.